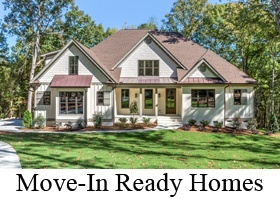 Outdoor living spaces continue to be a top request for 2014 Raleigh new home designs. Get 7 tips for how to design your outdoor living spaces, below. Design the outdoor living space into your home - by integrating at least two walls of the home into the deck, patio, or porch. 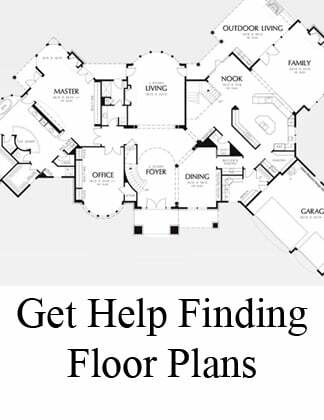 This will make your outdoor living spaces feel like a more cohesive part of your home - as they are physically structured into the floor plan. 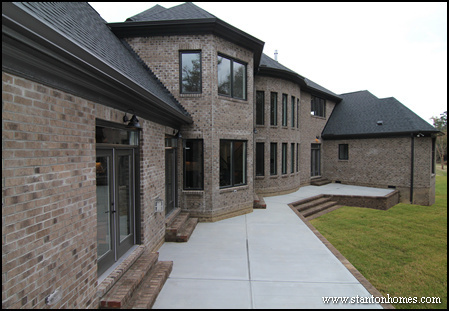 In this Raleigh new home photo, the concrete patio follows the full length of the home, encased by a wall at each end. Brick steps lead to a future swimming pool. You should always maintain continuity by using the same style or genre inside and outside. It can feel awkward if the interior of your home is contemporary and the exterior is traditional. For instance, in this version of the Worthington, the home owners used synthetic landscaping materials - a black colored bark material - to continue the contemporary feel of their home, inside and out. 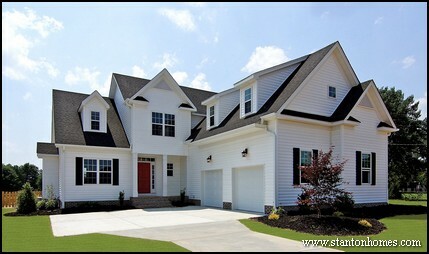 A white exterior, red door, and black shutters round out this homes exterior style. If you have a pretty good idea of what you want your outdoor living space to feel like, there are going to be more and less expensive alternatives that can create a similar upscale look. For instance, while patio pavers (made of brick, stone, or concrete blocks) are beautiful, they are typically more expensive than adding stamped concrete. 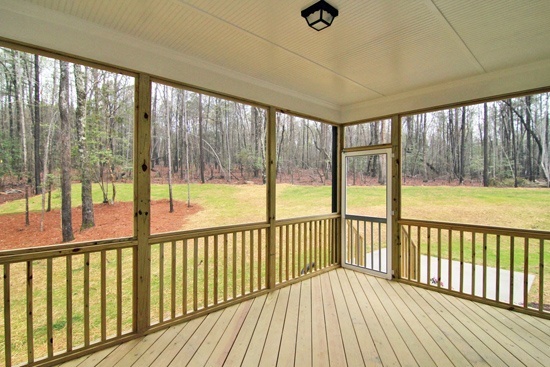 If you have the option of integrating two distinct outdoor living spaces, consider a screen porch and deck OR patio layout. 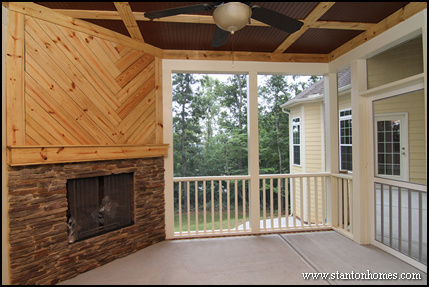 Screen porches are best year-round spaces, especially if you integrate a fireplace. 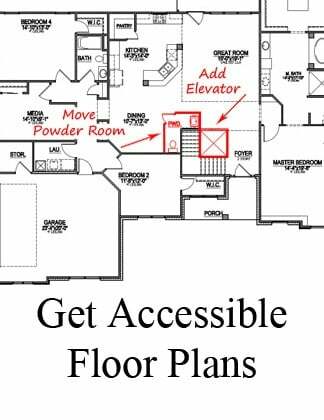 While it is tempting to get all the features you love into one space, you'll want to narrow in on a few favorites. Choosing a few special features will maintain a reasonable budget, and it will give your outdoor living spaces a center focus. 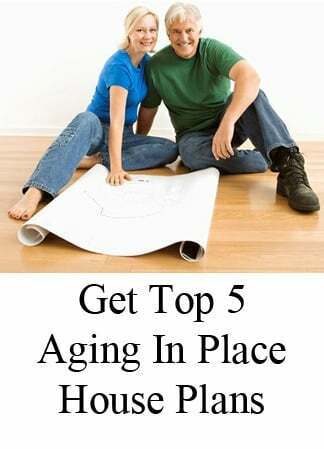 For instance, more 2014 home buyers are opting for a fireplace OR fire pit design. If you plan to use a table with chairs, you'll want to avoid designs that build in seatwalls. While some home buyers are opting to add a full-service kitchen to their backyards, others want to keep it simple - with a grilling deck. You'll want to ask yourself: how often will I truly use an outdoor cooking area? If the answer is on holidays, you're probably better off budgeting for an upgrade in the kitchen and a simple outdoor living space. Keep in mind that simple does not mean small! A large, rectangular deck can be cost effective - with a total cost that's much lower than a potential outdoor kitchen, for example. 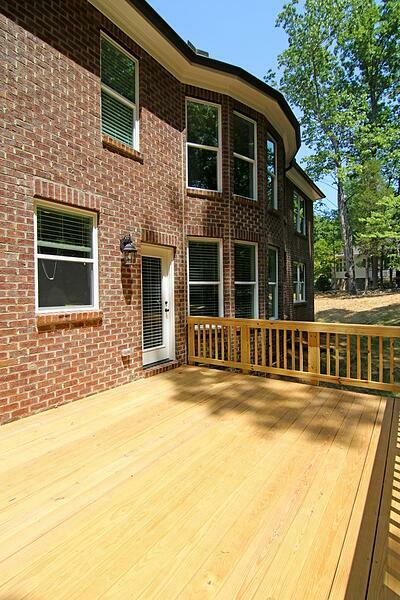 Ask your builder about including a built-in gas line for your grill - like in this custom home. Do you love working in the yard? Landscaping packages range from low to high maintenance. Many homeowners are opting to add their own landscaping, rather than pay for a landscaping package over 30 years. More surveys show that home buyers are integrating vegetable gardens in their backyard - consider where you might like to place a garden or integrate particular types of plants. 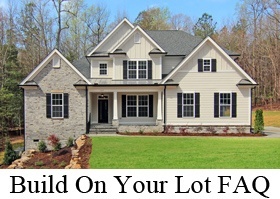 Raleigh new home outdoor living spaces are growing in popularity - see what special details can make your custom screen porch or rear patio stand out. 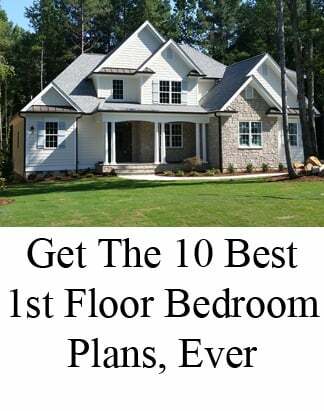 Find out more about beadboard ceilings, stamped concrete, and designer selections that make the "most requested" list for Raleigh custom homes! What is beadboard, and what does it add to your outdoor living space? Beadboard is a ceiling treatment that gives a routed design to previously flat panels or flat wood coverings. Beadboard is sometimes referred to as a "tongue and groove" treatment. Beadboard can be made of wooden planks, beadboard panels (as in this example), or even vinyl. Beadboard ceiling treatments give a your new home a more classic (and expensive) look and feel, without paying too much. 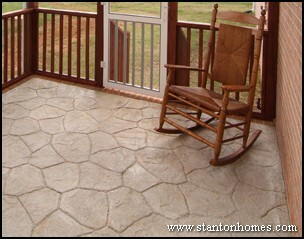 What is stamped concrete, and could it be a good choice for your new home porch or patio? Stamped concrete is created by pouring slab concrete into a walkway, patio, or porch, and imprinting a pattern, texture, and/or color. The stamp duplicates different surfaces, such as cobblestones, brick, wood, seashells, and others. This technique offers homebuyers a durable, realistic, and easy to clean alternative to pavers or natural stone. 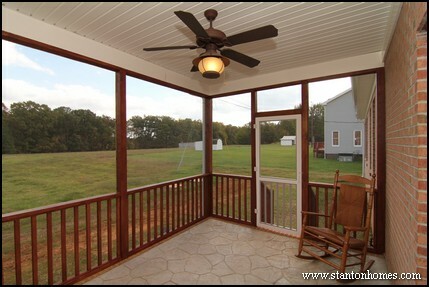 What other designer selections were included in this custom screen porch? 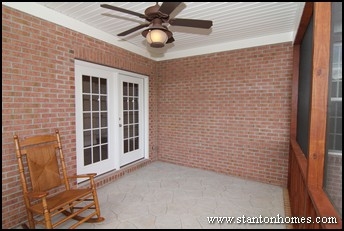 The ceiling fan in this screen porch is a lantern style in a deep bronze finish. The railing and posts are made of weather treated Northern hardwood, stained in a natural brown that blends perfectly with the brick exterior. 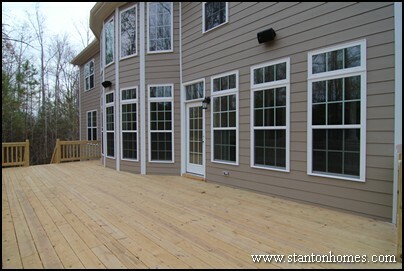 French doors lead outside from the great room. Looking for a custom home with a terrific outdoor living area? 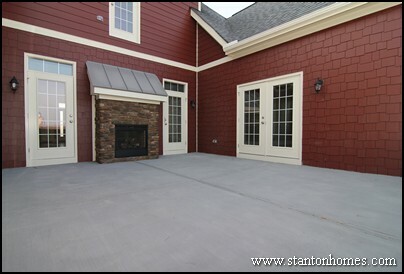 Stanton Homes on staff designers will work with you to create just what you have in mind - and give you suggestions on how to meet your budget, too! 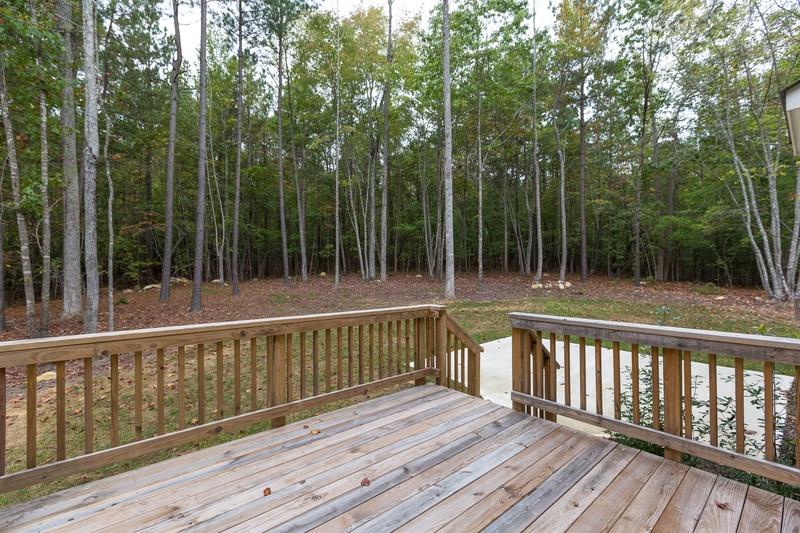 Want more outdoor living ideas for your Raleigh new home?